The Fire and Disaster Management Agency (FDMA) of the Ministry of Internal Affairs and Communications started operating the new Centralized Management System for Fire-fighting and Disaster-relief Helicopter Operation (hereinafter called the “New System”) in April 2014, in which the technology of the Disaster Relief Aircraft Information Sharing Network (D-NET) is utilized. D-NET has been developed by the Japan Aerospace Exploration Agency (JAXA). Many aircraft played a significant role in after the aftermath of the Great East Japan Earthquake and Tsunami which hit Japan in 2011. However, yet many challenges remain in the development of even safer and more efficient aircraft operation technology in the view of the predicted future large-scale disasters. To tackle these issues, JAXA has been doing research and development on fire-fighting/disaster-relief helicopter mobilization management system in cooperation with the FDMA. The FDMA has actively introduced the operation management system for more efficient operation of its fire-fighting/disaster-relief helicopters, hence, as of March 2014, 41 fire-fighting helicopters out of 76 are equipped with the operation management system. This number includes some helicopters belonging to municipal governments who have introduced the system on their own. 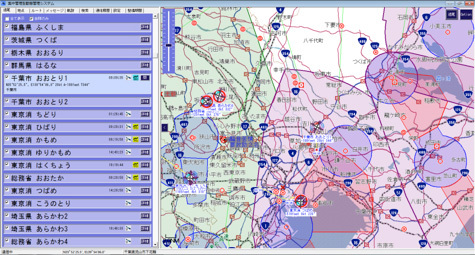 The conventional operation management system allows FDMA centers to track the position of all helicopters equipped with the system in real time no matter where they are in Japan. Adding to this, the new D-NET based will enable sharing of information including details of disaster-stricken areas and their status among centers and helicopters (seven aircraft as of March 2014). The “New System” is compatible with the D-NET data standard, which summarizes the necessary information that should be shared for safe and efficient disaster relief operation planning. The information contents were decided after discussions between JAXA and agencies responsible for fire-fighting, disaster prevention and medical helicopters. The “New System” is also able to share information with other aircraft management currently in use, so it is expected to spread further in the near future. Therefore, the “New System” is going to play an important role in the improved The FDMA and JAXA will continue to cooperate in order to contribute to the smooth collaborative activities among ground offices such as disaster-relief headquarters and aviation operation HQs in the case of a large-scale disaster, making possible more prompt relief activities based on safe and efficient operation decisions. *1 NAVICOM AVIATION CORPORATION (NAC) and JAXA jointly developed the data transmission function from an aircraft to a ground operation or disaster-relief headquarters for sending disaster information gathered by an aircraft. The function is now commercially available at NAC as part of the function of the NMS-01, a map information display device for helicopters. 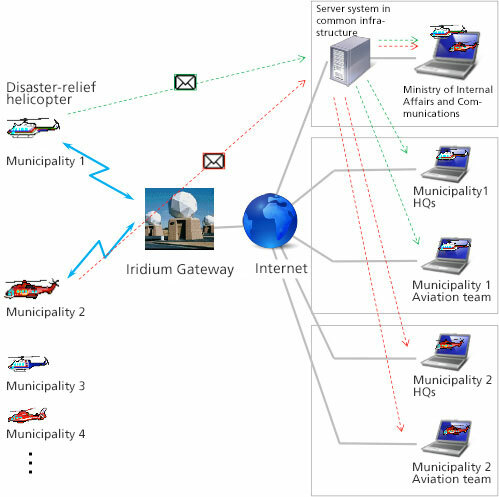 The new Centralized Management System for Fire-fighting and Disaster-relief Helicopter Operation introduced by the Fire and Disaster Management Agency (FDMA) of the Ministry of Internal Affairs and Communications was developed based on the IMS-01, a helicopter operation management system of NAVICOM AVIATION CORPORATION (NAC). The system is an updated version of the operation management system using conventional mail format to that with the server client format, thus it is robust even at the time of a disaster. The system adapted by the FDMA is additionally equipped with a function to manage and indicate maintenance information of each fire-fighting/disaster-relief helicopter, information being displayed on display terminals at FDMA aviation team offices all over Japan. Other functions and user-operability have also been significantly improved such as transmitting a message in a written form about a registered location or disaster status from an air-born helicopter to the ground by working with the NMS-01, a map information display device for helicopters of NAC. Location information is displayed once the user selects the helicopter they want to track. A message can be sent to a helicopter of the user’s choice. The message can consist of up to 58 letters for AMS-3000S-equipped aircraft and up to 300 letters for NMS01S-equipepd aircraft. Ground information can be searched by choosing a search method/category, such as an address, or a category. 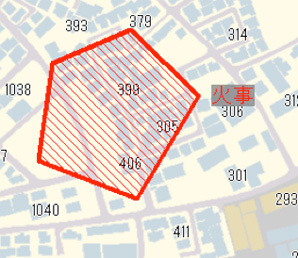 When a map display button is pushed, a map of the searched area shows up on the display. Transmitting a target destination to a specific helicopter is possible by selecting one helicopter. For NMS-01S-equipped aircraft, a route including a waypoint can also be sent. Location, line and area information can be sent to a selected helicopter. Also, location information set on a helicopter can be received and displayed. 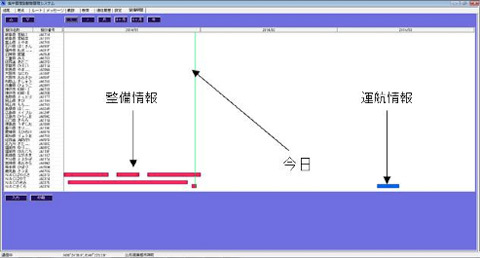 The new system enables the comprehensive display of information about maintenance (inspection/airworthiness test) period and operation of fire-fighting and disaster-relief helicopters as such information is input on a display terminal at FDMA aviation team offices all over Japan. When a large-scale disaster such as an earthquake occurs, many helicopters fly into the disaster-hit area from all over Japan to conduct relief operations such as information gathering, emergency rescue, and transportation of people and goods. 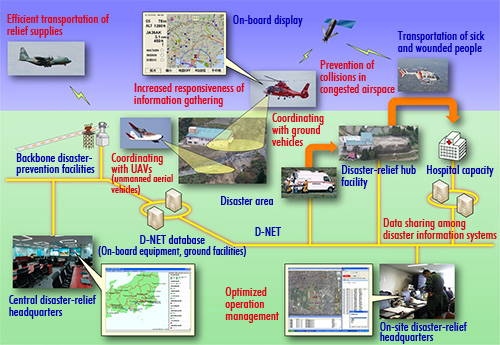 JAXA has been developing a Disaster Relief Aircraft Information Sharing Network (D-NET) that enables more efficient and safe aircraft operations management by promptly allocating an optimum task to each aircraft depending on its capacity and functions through data communication and information processing technology. Since 2009, JAXA has been evaluating and renovating this system in cooperation with the Fire and Disaster Management Agency (FDMA) and Kobe City Fire Department. The efficiency of D-NET has been evaluated and verified at the disaster-prevention day comprehensive drill and wide-area medical transportation drill on September 1, 2012, as well as at the "Kinki Region Emergency Fire department support drill" on October 27, 2012.